Years ago, a friend of mine, who then owned a small native plant nursery, asked me to help with her booth at a plant sale at the Bellevue Botanical Garden. At the time, I didn't know much about Northwest natives and I thought it would be a good way to spend some time with her and learn more. As we unloaded her truck, she pointed to a flat of plants. "These are Lewisia," she said as if I should know the significance of that. "Keep an eye on them or they will disappear," she added, somewhat sternly. I looked at the plants. They didn't look like anything special. None were in bloom. The leaves formed a flat, fleshy rosette that looked like they could be related to Echeveria (hens and chicks). Surely she didn't mean that anyone would steal one of these when we weren't looking?! We set up our display and she brought out signs with descriptions of the various plants, and for those not in bloom like the Lewisia, photos of the flowers. When I saw the photos, I began to understand why these plants might be of interest. These beautiful little alpine flowers will stop you in your tracks. What I also didn't realize was that very few people at that time propagated Lewisia for sale. They weren't available at nurseries then (although the L. cotyledon you see in the photo above is one I bought at West Seattle Nursery several years ago). You would have to go up into the mountains, as she had, and collect seed or get the seed from someone who had. Getting the seed wasn't even half the battle. These plants aren't easy to grow. They need sharp drainage and a fair amount, but not too much, sun. Of course, the plant enthusiasts at the sale that day already knew all of this. 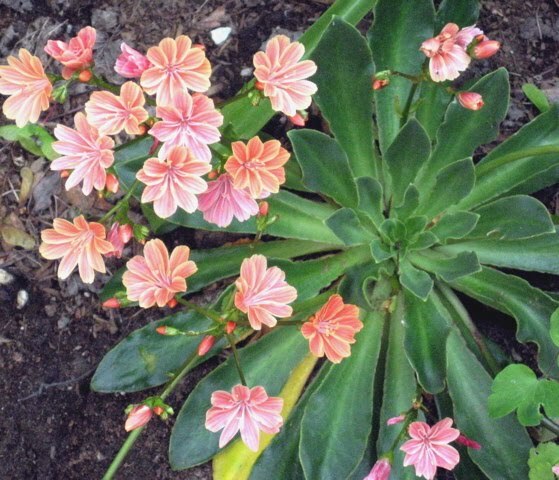 Once the sale began, word spread rapidly that we had Lewisia for sale. A crowd gathered. My friend could have sold that flat of plants 10 times over! She said she would sell only one plant to a customer. She knew how hard they were to grow and felt that if several gardeners each got a plant, there was a greater likelihood that some plants would survive than if just one or two people got them all. There was a lot of pleading and begging going on, but she stuck to that policy. We sold out of Lewisia in mere minutes. Lewisia is much more available today than it was back then. But it still isn't easy to grow. That doesn't mean you shouldn't try. If you are interested and have a sandy, rocky spot, buy a plant and see what happens. Every summer when my Lewisia blooms, I'm glad I did. If you'd like to learn more about Pacific Northwest native plants, I recommend Arthur Kruckeberg's classic reference, "Gardening with Native Plants of the Pacific Northwest ." 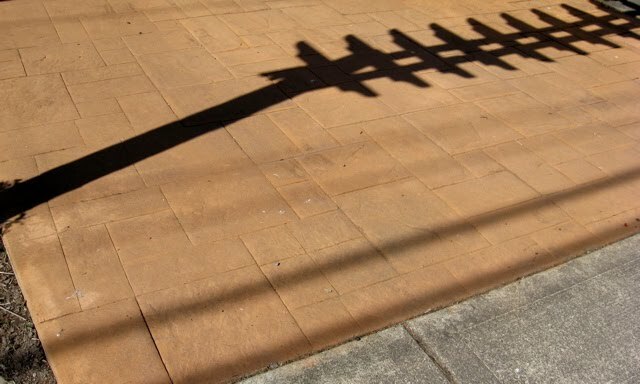 Our eyes are naturally drawn to walkways and driveways as we walk by the front of a house or look for a place to park. Because of that, the materials used for these paths are important elements in an overall landscape design. The best materials are those that both function well (right sized, safe and easy to maintain) and harmonize with the house. Here are examples of some good design ideas. This is an interesting choice. 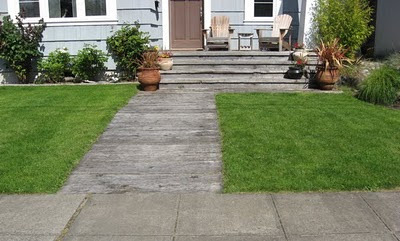 This walkway (above) connecting the sidewalk with the front porch is made of weathered cedar, which matches the weathered cedar stairs and deck. The house has cedar siding, too - it all works together. People often wrinkle their noses when I sing the praises of concrete because they think concrete is boring. It certainly doesn't have to be. It can take on any shape you can build a form for and it can be tinted, as it has been here, to go with any color scheme. 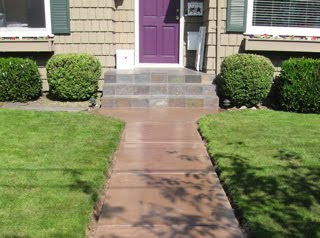 Note how well this colored concrete harmonizes with the slate stairs. The walkway in the foreground here connects the sidewalk to the front door of this house. Note how the expansion joints in the concrete give the impression of large, rectangular pavers. 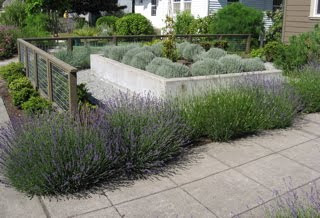 The walkway thus repeats the theme of this formal garden which has been laid out in a series of rectangles, emphasized by the concrete walls of the raised bed. The concrete for this carport has been both tinted and stamped to give it a lot more character than a typical, plain slab of grey. Note how the rectangular pattern in the stamp repeats the rectangles you see in the shadow of the arbor overhead. Concrete stamps are available in a variety of patterns. 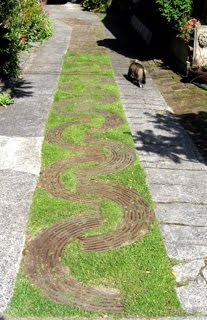 This long driveway combines concrete for tire treads, with grass down the center which allows rain water to soak into the ground rather than run off into the storm sewer. The metal 1/2 circles, which appear to be recycled from some industrial project, add a charming touch. If you are thinking of replacing a walkway or driveway, take a little time to walk around the neighborhood and see some of the creative solutions out there. There are no end to the possibilities. Too rainy for a walk? Check out "Curb Appeal ," from the editors of Sunset Books, for more inspiration. Before and after photos show how changes in exterior features, including walkways and driveways, plus paint, fencing, lighting and other do-it-yourself projects can make all the difference in how you feel about that place you call home. 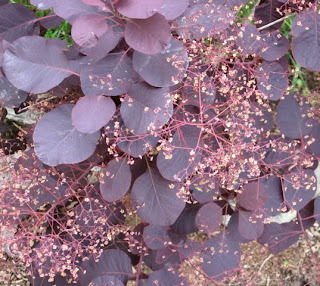 Smoke trees (Cotinus coggygria) are wonderful additions to small, urban gardens. They may eventually reach 25' in height, but can be pruned to stay much smaller. Typically, they are multi-stemmed, but can be trained to have a single trunk, as this one has. They are called "smoke" trees because as their flowers fade, they take on a fuzzy appearance that looks like puffs of smoke. Here you can see a closeup of the tiny, yellow-green flowers and those gorgeous purple leaves. Later in summer, these flowers will take on that characteristic "smoky" look. 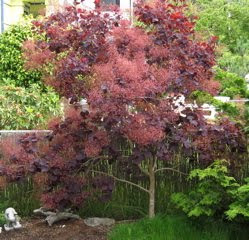 In addition to the dramatic flower display, smoke trees have stunning red-orange fall color. They are also drought tolerant, once established. They thrive in poor, rocky soil. And they come in colors other than purple, which you can read about in this post, More Smoke Trees. I've been noticing that the roses in West Seattle gardens are particularly beautiful this year. This is worth noting because the climate in the Pacific Northwest is not the best for growing roses. Roses love sun and we don't get a lot of it. Our cool, damp days are better suited to the growth of fungal diseases, like black spot, that love to build colonies on the leaves of our rose plants. So why are our roses looking so good this year? I suspect that it has to do with the extra rainfall we've had this year. Our usual rainfall pattern is that we have adequate rain to keep gardens looking lush through the month of May. In June, we often have a lot of cloudy days, but not very much rain. Gardeners are fooled by the cloudiness into thinking the garden is getting enough water, when that isn't necessarily the case. 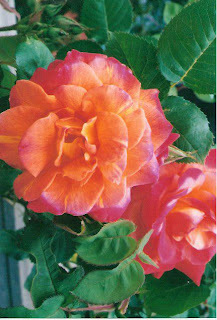 Particularly with roses, which are greedy on all fronts: they want lots of water, sun, and nutrients. So far this year, we have had three times the usual amount of rainfall for the month of June. This has had the effect of extending bloom time for lots of spring flowering shrubs and perennials. Roses, most of which are at the beginning of their bloom season, are getting off to a healthy, well-watered start this year. If you want to keep the bloom on your roses throughout the summer, I suggest that you consider following up with a good fertilizing routine. Ideally, that routine would have started months ago, but whatever you do to feed your roses from here on out will be rewarded. If you are fertilizing your plants for the first time in June, skip step one and continue from there. Be aware that even under the best circumstances, there are some rose varieties that are hopelessly susceptible to problems. If you have them in your garden, you might be better off replacing them with hardier cultivars. Ask at West Seattle Nursery for suggestions. There are lots to choose from. Enjoy! 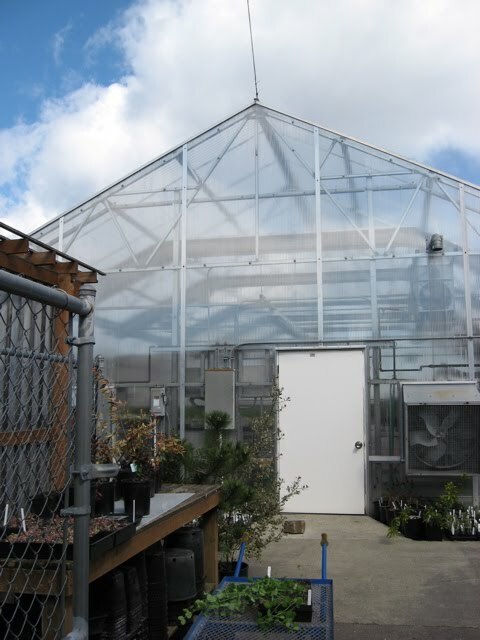 Do you need a Horticultural House Call? For more information or to make an appointment, please email me. 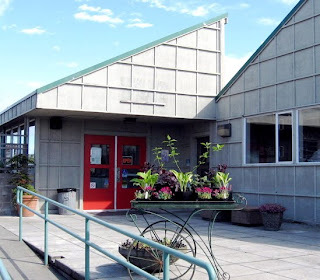 This spring, I had the pleasure of "ghost blogging" for the Puget Ridge Garden Center at my alma mater, South Seattle Community College. This retail nursery/teaching facility is part of the Landscape Horticulture complex, completed just a few years ago, which includes the garden center, a greenhouse, cold frame building, head house, lath house and classrooms. This complex is a far cry from the dilapidated, 20-year-old, "temporary" classrooms that were in use when I was a student. After years of promises that construction would start "next fall," until fall came, and then "we'll break ground in the spring," and then more promises the following fall, it makes me happy to see this facility finally completed. I've enjoyed visiting the college weekly, seeing what is new and taking photos. It has reminded me of how much I enjoyed plant ID, landscape design, horticulture science and propagation classes. It was one of the great joys of my life to be so immersed in the study of something I loved so much. Even though I stepped away from design and consulting work in recent years, due to health issues, I never lost my passion for it. Spending time at the college these past months has reminded me of that, and it has been part of the reason I am returning to the business. But now the quarter is drawing to an end and the garden center will be closing until fall. Will I will resume my "ghost" blogging position then? I don't know. What I do know is that there are some great deals to be had on plants this week and next. There's some gorgeous plant material there, with prices at or near wholesale. While you're there, take a look around. Maybe you, too, will be inspired to sign up for a class. 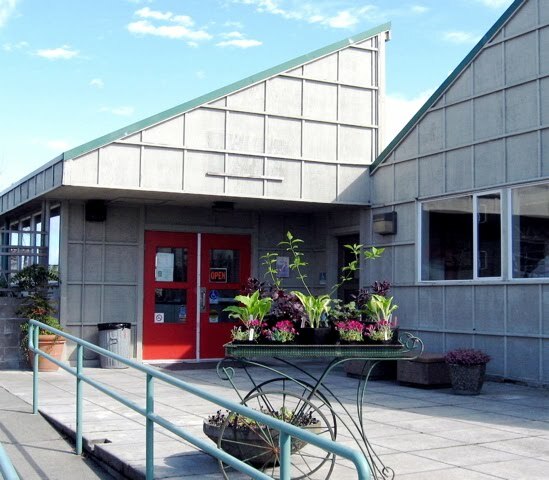 Check out the Puget Ridge Garden Center blog for more details on dates and hours open. Who's Been Spitting on Your Plants? 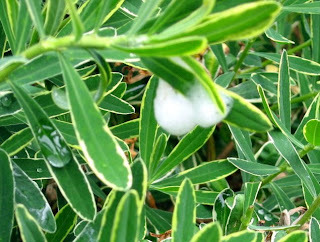 Have you noticed what looks like blobs of spit on some of your plants lately? This foamy substance is brought to you by an insect called, appropriately enough, a spittle bug. The foam protects juvenile bugs from its predators. Once the young insects outgrow their need for protection, the spittle will disappear. 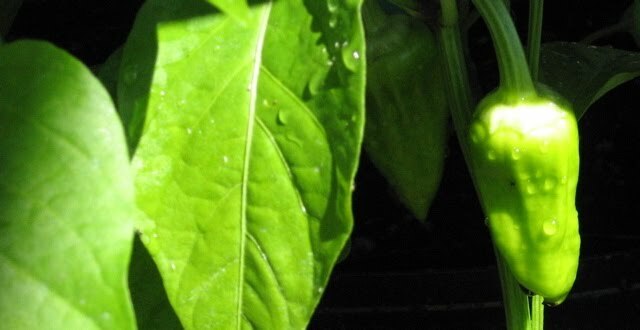 Even though spittle bugs feed by sucking juices from plant stems, they rarely do any damage to your plants. If you want to get rid of them, simply turn the hose on them and wash them away. Want to know more? Here's a link to information about spittle bugs.